We knew it was coming. When Nest bought the camera maker DropCam for a cool half billion last year, it seemed inevitable that a surveillance camera would be Nest’s third big hardware release. Today, Nest announced Nest Cam—along with a subscription service called Nest Aware. Let’s start with the Cam, which popped up on BestBuy’s website a few minutes before the announcement. It’s a kissing cousin to DropCam’s models—not a huge surprise that Nest has done a fairly straightforward rebranding of the product it acquired last year, though there have also been some upgrades: A redesigned body for example, with a magnet that will make it far easier to hang around the house. The camera itself still streams 1080p video with a 130 degree field of view, and many of the other features will feel familiar to any DropCam user. So what about Aware? This is Nest’s cloud-powered subscription service for its new camera, first uncovered on Home Depot’s site by Wired; it lets you do things like visit your camera’s month-long history, share clips, and define “activity zones,” where the cam will alert you if it notices any kind of movement (in a baby’s crib, say, or a foyer). Another cool feature will make you a time lapse using footage—whether of your whole day or a project you’re working on. How much will it cost? Nest has yet to confirm with us, but it sounds as though it will be a two-tiered subscription service based on history length. A 30-day history will cost you $30 per month, while 10 days of retrieval powers will run $10 per month, according to Alice Truong on Twitter. Meanwhile, privacy, as always, will be an important issue with the cloud-based service, which went unmentioned at today’s announcement. We’ve always known that Nest wanted its products to talk to each other, but it hasn’t been explicit about what that means yet. Not only does Cam use the same UI language as Protect and Thermostat—and the same system of hue-based notifications—it’s also wired to work with its sister products now through a new app announced today. This is what gives us a real glimpse at Nest’s grand plan: For example, if your Nest Protect senses smoke, Cam will automatically turn on and ping you so you can see what’s going on. This has been a hugely annoying part of owning a Protect—when I get a notification on my phone, it’s impossible to check what’s going on remotely. In other words, Nest just added eyes to its smelling, feeling home sensing system. Google is getting serious about building an all-seeing, all-knowing intelligent architecture—and we’ll just have to wait and see what that architecture will ultimately mean for users, especially when it comes to privacy. 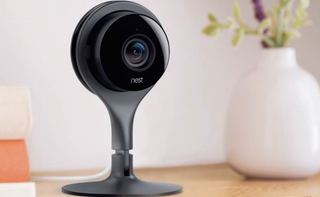 Go check out Nest Cam’s specs on Best Buy—you can pre-order one for $200 right now. No word on how much the Aware subscription will cost, but I’ll update this post when we know more.